View More In Leg Warmers. Super soft warm thick knit makes these leg warmers a great find. 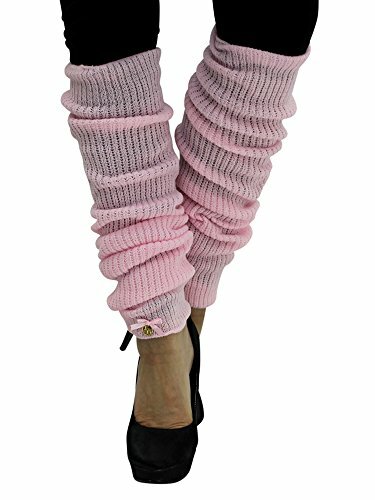 Wear over your boots, pumps or with ballet slippers for dance class, these leg warmers add style to the simplest of outfits. These rich looking solid colored leg warmers are knit with a waffle patterned weave throughout, creating a soft and cuddly feel. Slightly elasticized at top and bottom edges of each leg warmer for secured placement. Finished off with classic Luxury Divas logo and tiny bow. These leg warmers are exclusively made and sold by Luxury Divas. Product details and images are accurate only when purchased through Luxury Divas. Leg warmer measures 5 inches wide, un-stretched. Measures 24 inches long, end to end, un-stretched. Top and ankle openings are 3.75 inches wide in diameter, un-stretched.